White sweet potatoes. I am obsessed. I love them. 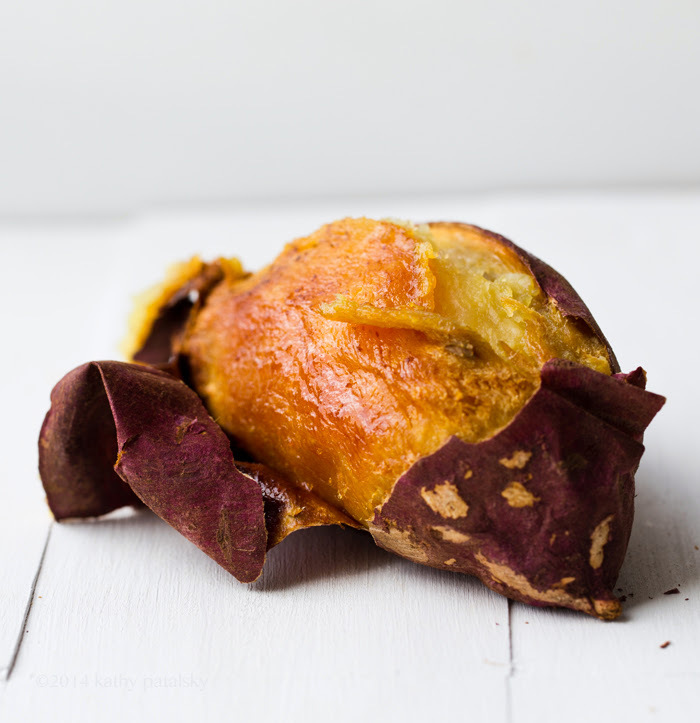 They are the ultimate in sticky-sweet baked yam perfection. 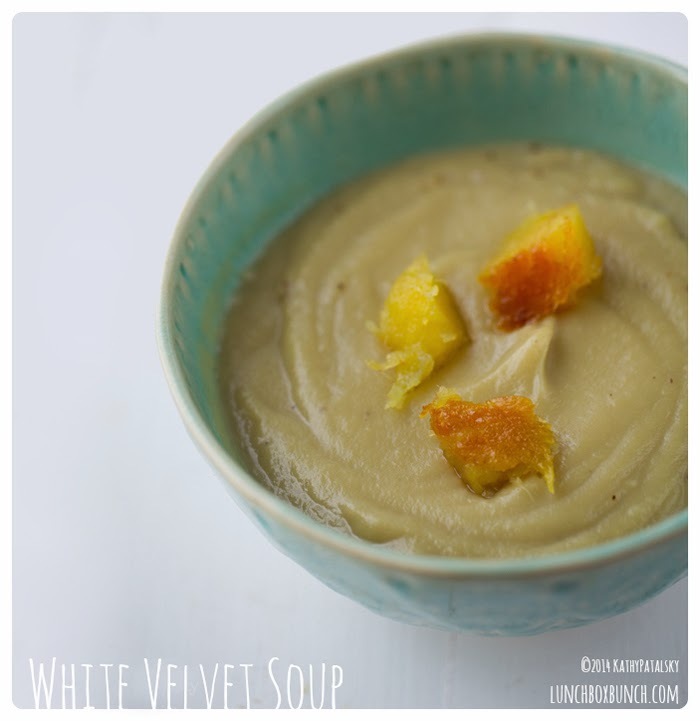 And this white sweet potato soup, aka White Velvet Soup, is just way too easy to make. I have already made it twice, and I am plotting when to make it again. 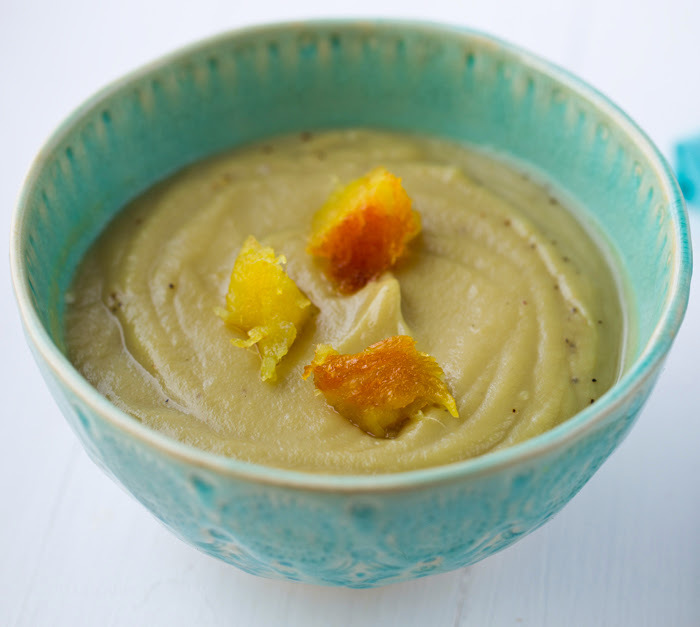 Sweet potato lovers, this is a dreamboat of a soup.. 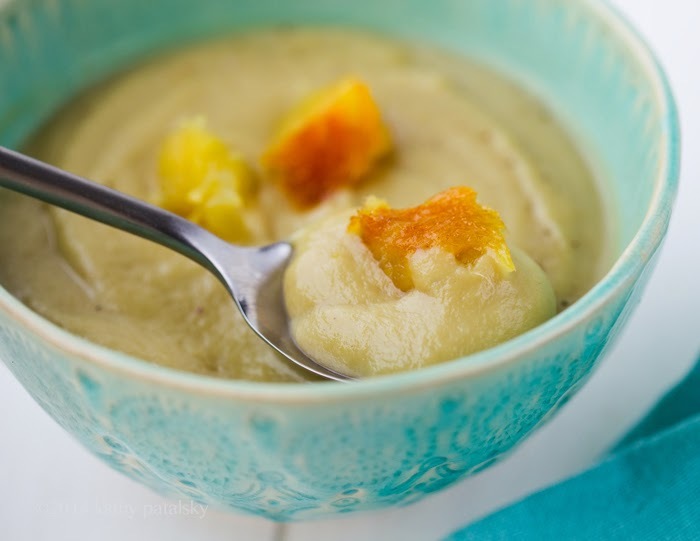 This silky white sweet potato soup is a new comfort food favorite. I like to serve it as a hearty, warming, cozy soup starter alongside something light like a grain and veggie salad. 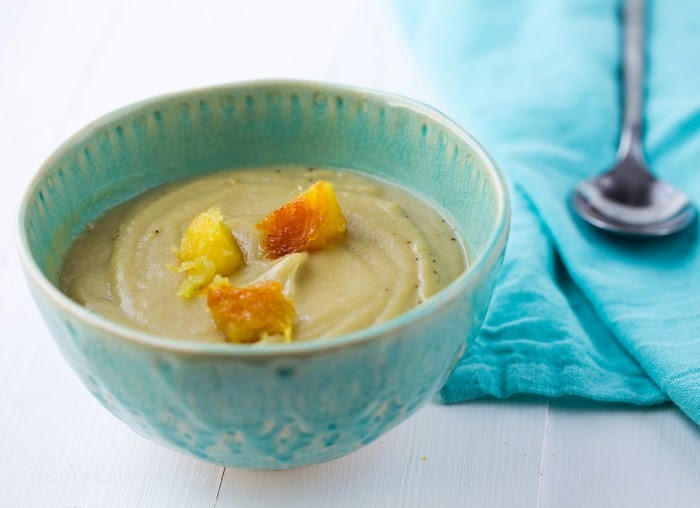 The soup includes sweet baked yams, creamy white beans, a hint of dreamy coconut oil and maple syrup and simple salt and pepper. 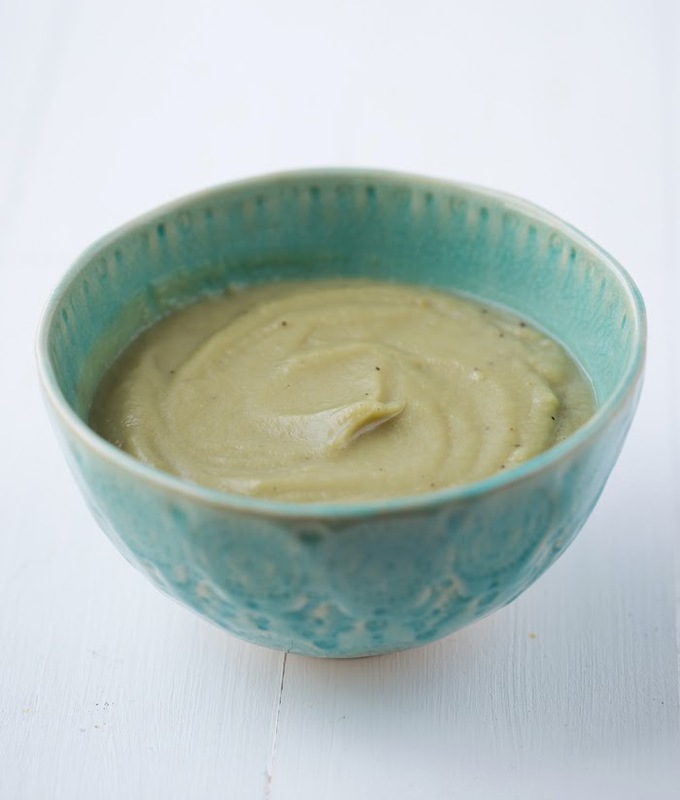 Liquid: You can use all non-dairy milk for ultra-creamy or do a mixture of non-dairy milk and broth for a thinner texture. 1 cup+ unsweetened or plain almond or soy milk OR broth/non-dairy milk mixture, add liquid to blender warmed. Optional: Spice things up! Add in cinnamon, ginger powder, cayenne or turmeric to add some spice. 1. Preheat oven to 415 degrees. Wash and scrub potato and poke a few holes in the top of the potato to vent steam. 2. Bake the potato right on the oven rack for at least 50-60 minutes. Longer if needed. You want to potato skin to practically fall off the potato when it is fully baked. The flesh should be sticky sweet, soft and velvet-y. 3. Warm the liquid you will be using, either in a mug in the microwave or on the stovetop. Warm liquid means the soup will be warm enough to simply pour and serve if you'd like. You can also drain and rinse your cooked white beans and warm your coconut oil. 4. Remove potato skin and discard. 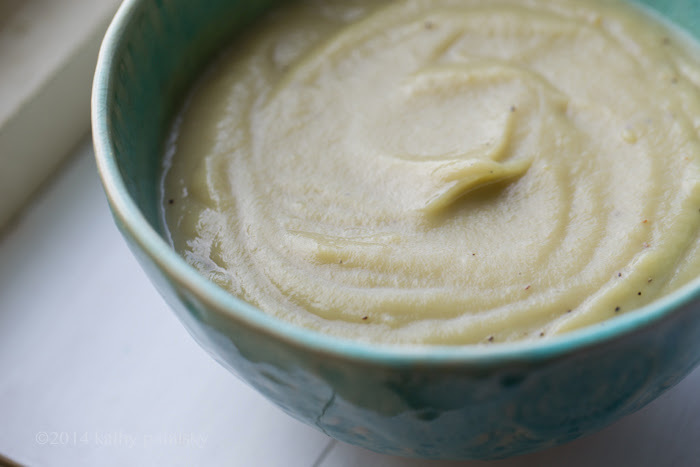 Add potato flesh (retain a few diced cubes as garnish if desired) and all soup ingredients to a high speed blender. Blend from low to high until silky smooth. You can now add in more liquid if you'd like a thinner soup. I like my soup very thick and creamy, but you can choose your favorite texture. 4. Season to taste and pour into bowls to serve. Garnish optional.